This is a Chinese name; the family name is Zhu. 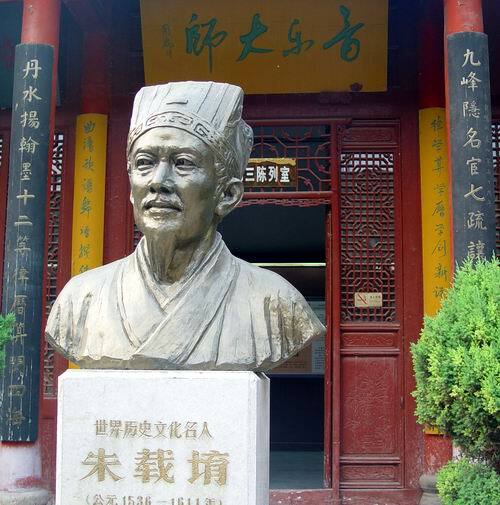 Zhu Zaiyu (Chinese: 朱載堉; 1536 – 19 May 1611) was a Chinese mathematician, physicist, choreographer, and musician. He was a prince of the Chinese Ming dynasty. In 1584, Prince Zhu innovatively described the equal temperament via accurate mathematical calculation. Zhu wrote on music theory and temperament (five treatises survive), music history (two treatises survive), dance and dance music (five treatises survive), and several other works. Three music theory works in particular are associated with the ideas of equal temperament, the「律學新說」 (" on the equal temperament ", 1584), 「律呂精義」("A clear explanation of that which concerns the equal temperament", 1595/96), and 「算學新說」(" Reflection on mathematics", 1603). His work has been described as "the crowning achievement of two millennia of acoustical experiment and research (Robinson 1962:224)" and he is described as "one of the most important historians of his nation's music." Zhu also wrote treatises (three survive) on astronomy, physics, mathematics and calendrics, calculated the magnetic declination of Peking, the mass density of mercury and accurately described the duration of one tropical year to correct the Ming calendar. Wikimedia Commons has media related to Zhu Zaiyu. ^ Robinson, Kenneth. A critical study of Chu Tsai-yü's contribution to the theory of equal temperament in Chinese music. Wiesbaden : F. Steiner, 1980. ^ Fritz A. Kuttner. "Prince Chu Tsai-Yü's Life and Work: A Re-Evaluation of His Contribution to Equal Temperament Theory", p.163, Ethnomusicology, Vol. 19, No. 2 (May, 1975), pp. 163–206. Cho, Gene J. The discovery of musical equal temperament in China and Europe in the sixteenth century. Lewiston, N.Y. : Edwin Mellen Press, 2003.